A new agreement on the development of healthy food products between Israel’s Tel-Hai College and New Jersey’s Rutgers University brings together two groups that together, leaders of the institutions believe, will be able to greatly advance the cause of healthy foods. A cooperation deal between Rutgers, Tel-Hai, and the State of New Jersey to form the New Jersey-Israel Healthy, Functional, and Medical Foods Alliance was signed earlier in September at a ceremony on the campus of the Rutgers Food Innovation Center, an incubator/accelerator that works with start-ups developing technology for healthier prepared foods. Israel is well-known for its agricultural technology. Israeli cows, for example, are the world champs in milk production, yielding on average 12,000 liters of milk a year, far more than anywhere else (in the US, it’s about 7,000 liters). Israel is also a world innovator in applying big data tech to increasing yields on farms: Big data applications from a company called Akol tell farmers which crops they should plant, based on climate and location, and when to plant and harvest for maximum yields. Other Akol applications provide information to farmers on feed mix to give their cows, ideal storage procedures for their climate, tracking the growth of chickens or livestock, temperature control procedures based on current weather, and tracking fruit growth and scheduling irrigation. They also generate reports of milk samples for quality control. New Jersey, meanwhile, is a leader in processed food production. While the Garden State is perceived as an urban center (due to its proximity to both New York City and Philadelphia), it is actually a leading state in terms of agricultural income per acre, and one of the top states for processed food manufacturing. 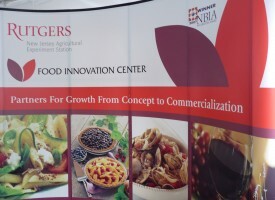 The Rutgers Food Innovation Center seeks to leverage these capabilities in order to support and expand the state’s food industry. Discussions that led to the alliance’s formation began during a visit to Israel last June by Lou Cooperhouse, director of the Rutgers Food Innovation Center, and Jessica Paolini, economic development manager with Choose New Jersey, a non-governmental agency with statewide marketing efforts for economic development purposes. Michele Brown, president and CEO of Choose New Jersey, participated in the announcement ceremony at Rutgers. For Tel Hai, located in the far north of Israel, close to the Lebanese border, the project is a major boost – one of the highest-level international agreements it has entered into. This entry was posted in News and tagged Food, Health, Rutgers on September 30, 2015 by admin. This entry was posted in News and tagged Food, Rugers on June 25, 2015 by admin. Israeli cookbook author Janna Gur—one of the pre-eminent experts on the Israeli food scene—is coming to New Jersey to make two appearances next month. Discover why some see her becoming the Julia Child of Israeli cooking. Gur’s latest cookbook, Jewish Soul Food: from Minsk to Marrakesh, More than 100 Unforgettable Dishes Updated for Today’s Kitchen, has an important Jersey connection. Nirit Yadin of East Brunswick, a fixture on the Central Jersey food scene, collaborated on the book with Gur, a long-time friend who’s also founder and editor in chief of Israel’s leading food and wine magazine, Al Hashulchan (which Yadin translates as “On the Table”). This entry was posted in Event and tagged Event, Food on October 25, 2014 by admin.